"Hokkyokusei(北極星)" was the first omu-rice (Rice filled omelet) restaurant in Japan. Today,omu-rice is one of the most popular Yousyoku(japanese-style westeran food) dishes here. Omu-rice bigan at a Hokkyokusei restaurant in 1925. Oneday,a regular customer,who had a stomach condition,ordered an egg omelet and white rice,as always. 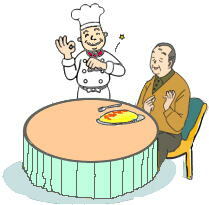 The owner felt badly about this costomer always ordering the same dish and wished to serve him something different. So,the owner cooked a special dish wrapped in ketchup ricein thin-baked eggs. That is how omu-rice was born. The customer was so pleased and asked the name of the dish. The owner answered"it's called an omu-rice---omelet and rice became one." And that's the origin of the name omu-rice. copyright©2014 Hokkyokusei Sangyo Inc all rights reserved.